Like trailer hitches and ball mounts, electrical connectors range all over the board in shape, size and capability, but no matter what your trailer's electrical functions are, you need a solid connection to keep the power flowing and ensure safety on the road. 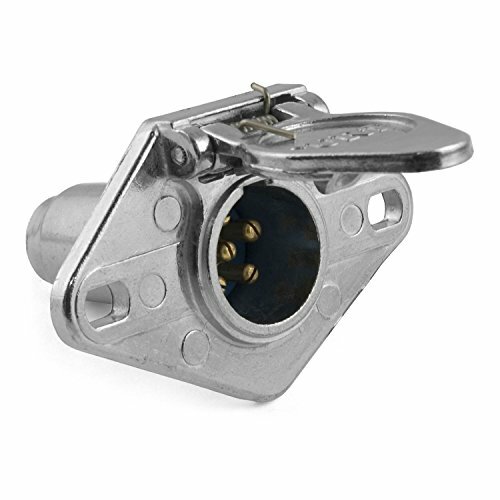 CURT electrical connectors are designed and manufactured to give you a reliable connection every time you plug in your trailer.This 6-way round connector is designed to supply power for tail lights, turn signals, electric trailer brakes, a 12-volt battery and brake lights, as well as a ground connection. It features durable die-cast metal construction and comes with a spring-loaded steel cover to resist damage from dust and water. This 6-way round connector is a female-end socket, specifically designed for the vehicle side of the connection. 6-way round connectors are commonly used on livestock trailers, boat trailers and utility trailers.